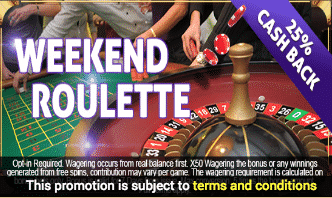 Enjoy every weekend at Conquer Casino UK with a great promotion. Grab your 25% Cashback up to £300 on any Roulette table every Saturday and Sunday. Get it by accessing the platform from this offer, signing into your account, and making a deposit using the code CASH. Bear in mind you have to play your bonus 50x before requesting a withdrawal from this promotion. Come and improve your Roulette experience with this promotion!